Impact indicators are used to monitor shocks and impacts at any point in the supply chain. When an impact exceeds a predetermined level (G-force) the device will activate and turn red. 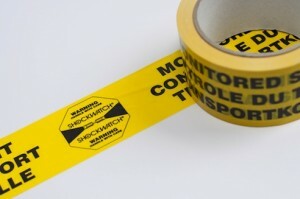 Transport safety can be enhanced by mounting warning labels or warning tape on the package. Application in electronics, telecommunication, glass and ceramics industries, furniture and household appliances, pharmaceuticals, transportation and aviation. Tilt indicators are used to monitor unacceptable tilting on goods that must remain upright during transport. The product can’t be tipped without indisputable evidence of mishandling. If the package is exposed to an impact that exceeds a predetermined level (G-force) the glass tube will break and the device will turn red. 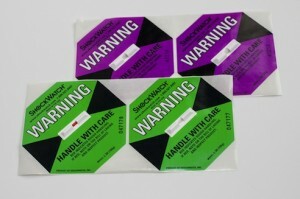 Transport safety can be enhanced by mounting warning labels or warning tape on the package. The indicator will in itself NOT prevent impacts and damage to the product, but it will reduce mishandling during transportation and storage merely by its presence. 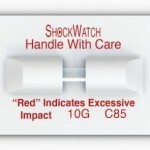 ShockWatch indicators are offered in smaller sizes for objects that require embedding. Contact us and we’ll find the right alternative for your needs! 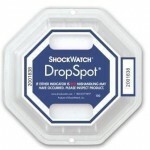 Single-use impact indicator for monitoring large and heavy shipments. Mechanically armed at mounting – no risk of deployment during storage and field use. Application in electronic, telecommunication, glass and ceramics industries, furniture and household appliances, pharmaceuticals, transportation and aviation. The indicator will in it self NOT prevent impacts and damage to the product, but it will reduce mishandling during transportation and storage merely by existence. 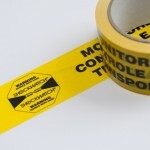 Transport safety can be enhanced by mounting warning labels or warning tape on the package. 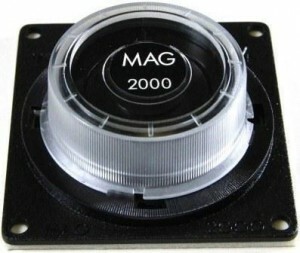 MAG 2000 impact indicator is a low cost reusable device. Designed to monitor the handling of heavy (over 250kg), sensitive and fragile products. Widely used to monitor impacts during transportation and loading of carriages and lorries. The device utilizes two triggered magnets. when the shock is strong enough to disrupt the magnetic attraction it results in the upper magnet moving and appears in a visible position within the device. By the position of the upper magnet, you can determine the angle of the impact. The device can be reset with a special key and thus the device is reusable. This special key also prevents tampering. Certain products must remain upright during transport. It can be challenging to ensure that the product hasn’t been tilted accidentally, The TiltWatch XTR tilt indicator ensures that the product is handled in an upright position during transport and storage. The detector in the centre turns red if the package is tilted past 83 degrees. The device is serialized to reduce risk of tampering. Humidity, temperature changes and other external circumstances do not effect the function of the TILTWATCH XTR -device. 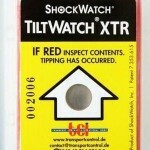 The tilt indicator will activate when mounted on the package, will not activate during normal handling conditions. 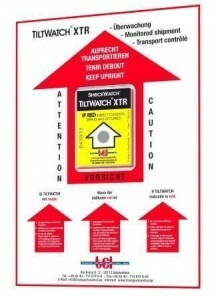 Mounted together with the warning label the TiltWatch XTR is visible for everyone handling the package. This ensures that the package is handled with care according to its features. 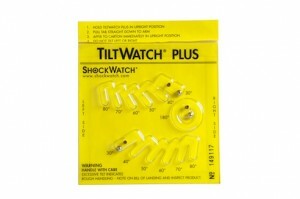 TiltWatchPlus tilt indicator for transport of fragile products to be transported upright. Provides 360 degree monitoring. Application especially for products that are easily damaged by a very small degree of tilt during transport and storage. TiltWatchPlus indicates whether there has been tilt to left or right, the degree of tilt and if complete overturn has occurred. Stainless steel, non- magnetic indicator registers clearly and irreversibly if the product has been tilted. 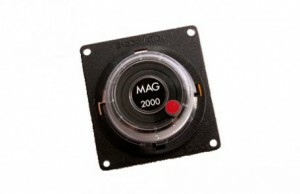 Each indicator is serialized to minimize the risk of tampering. Humidity, temperature changes and other external circumstances do not effect the function of the device. 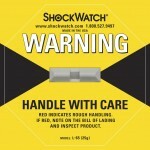 The tilt indicator will activate when mounted on the package, will not activate during normal handling conditions. 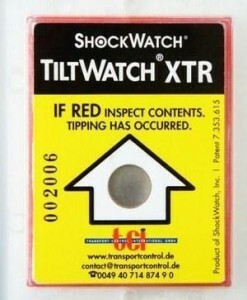 Mounted together with the warning label the TiltWatch XTR is visible for everyone handling the package. This ensures that the package is handled with care according to its features.